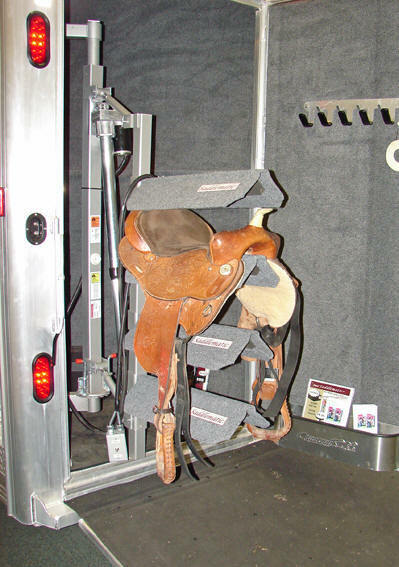 New Improved Electric Saddlematic will be introduced at the National Western Stock Show in January. 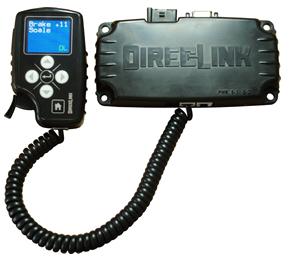 New quieter, simpler electric actuator replaces hydraulic unit. 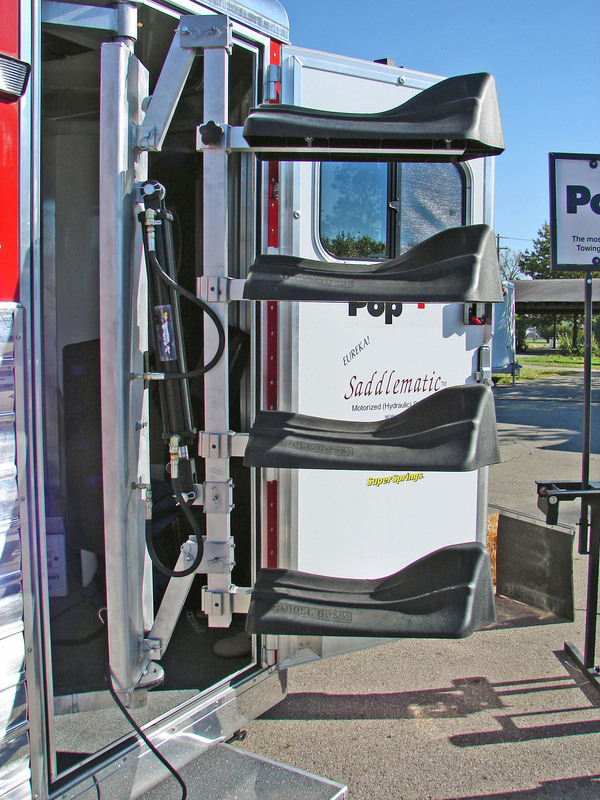 In our continuing effort to improve Saddlematic, the new side and rear tack power saddle rack can be installed quicker and easier. And the price has dropped for an even better value. 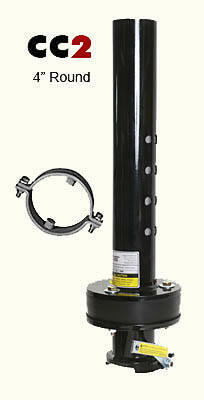 The rear tack which now has a swing-out feature, along with the side tack swing-out model is only $1595. The new narrower model will give you more room and the new saddle pads allow more saddles. With it’s double hinge, Saddlematic’s rear tack model can point the horns in or out to stay in place on those rough roads. 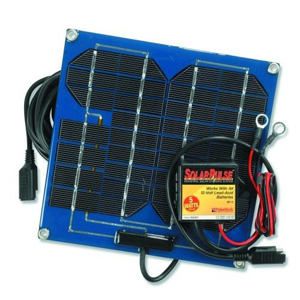 Saddlematic trailer power saddle rack. As seen at RFD TV on Equestrian Nation about Saddlematic. 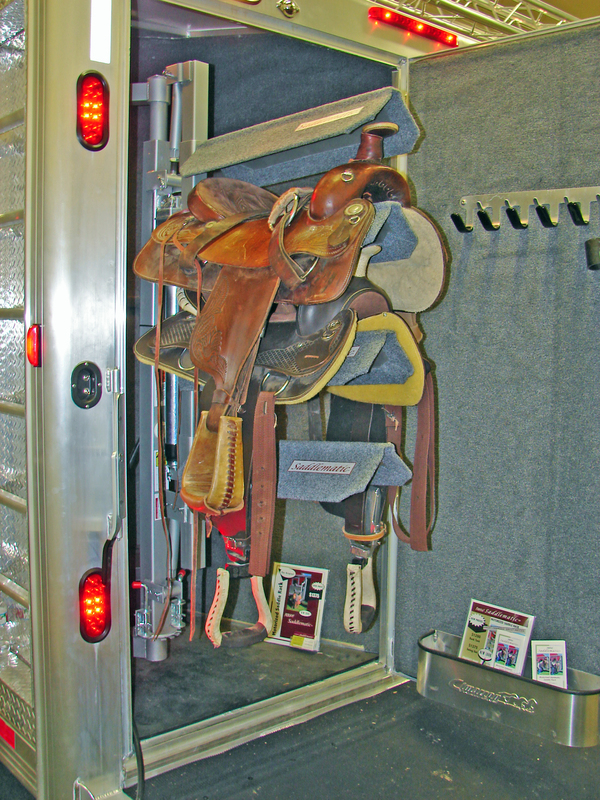 You know the problem, saddles scattered on the floor of your trailer, bad back, the kids can’t reach the top saddles in the rack, having to touchup those expensive show saddles each time they go into your trailer. 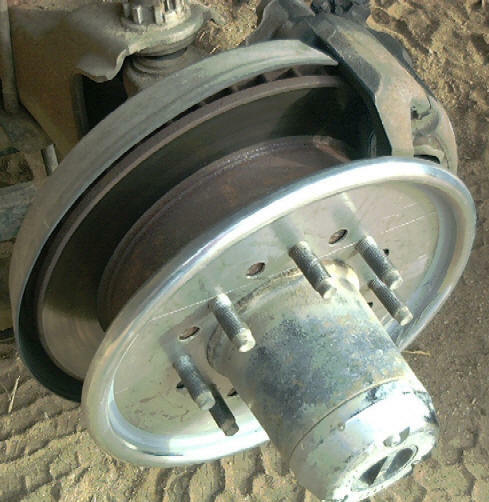 I am constantly looking for the latest and greatest trailer accessories and am surprised when I find them next door. 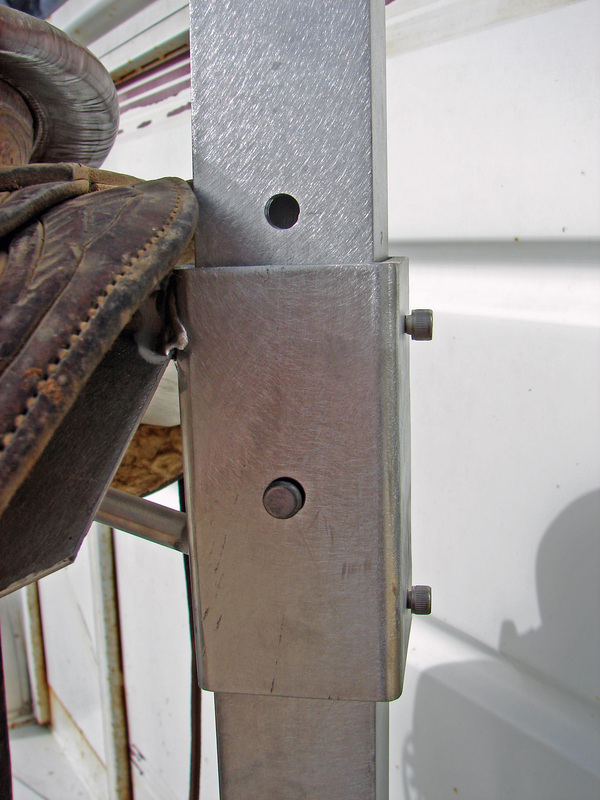 Jim Flynn, a professional welder and team roper invented the Saddlematic. It’s the only motorized saddle rack I’ve seen. 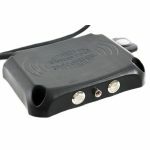 Corded remote control (yellow) can be hand held or used in it’s bracket. Truth is a lot of folks can’t, won’t or get tired of using the top racks of their factory saddle rack. Then the fancy show saddles get thrown on the floor on top of each other. I have some saddles like that, getting out the boot polish to cover all the scuffs. The Saddlematic is all aluminum, to make it light and beautiful. It only takes about an hour to install and is quick attach like the factory saddle racks with spring loaded pins top and bottom. The design is well thought out, made in the US by horse people. Two models, stationary and swing out for rear and mid tack. 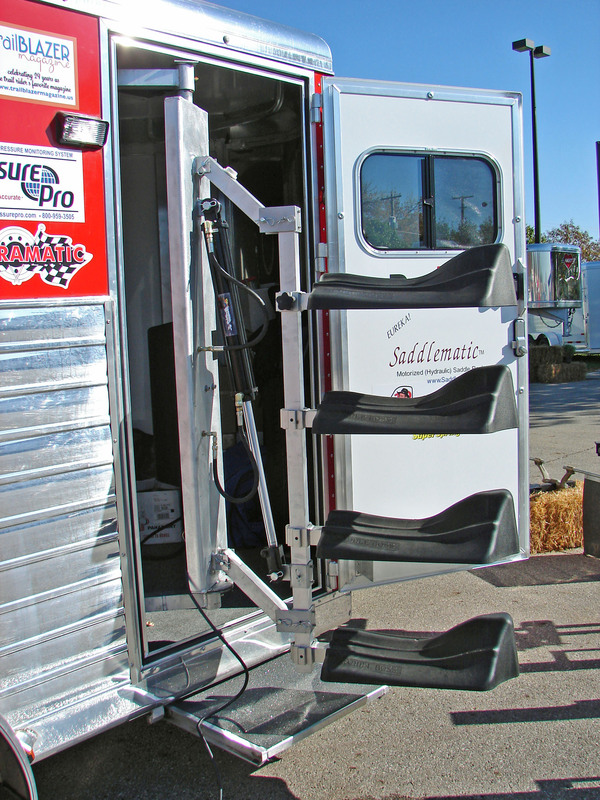 Saddlematic is customizable from 3 to 5 saddle platforms. Tested flawlessly over 5000 times with 50 pounds per rack. 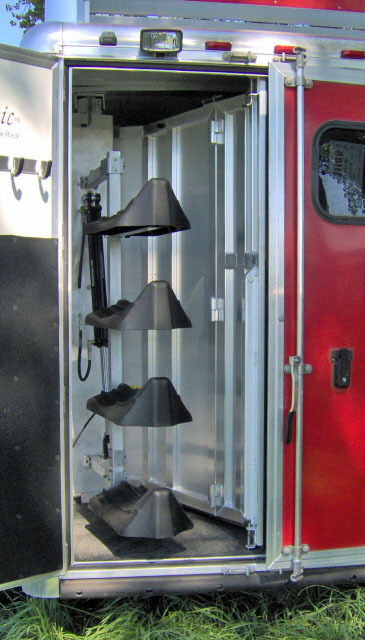 The saddle racks are adjustable and is lockable at any height. The swing out model locks in position in and out of the tack room. 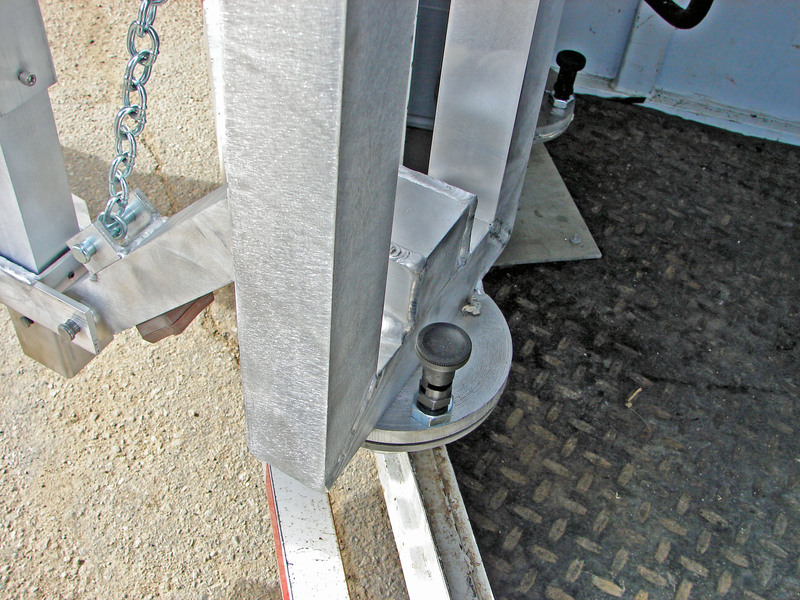 Rear swing out model can swing in the trailer forward or rearward to keep your saddles on the rack as your trailer bounces down the road. 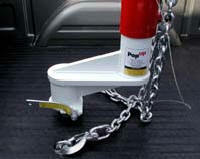 A great horse trailer accessory. 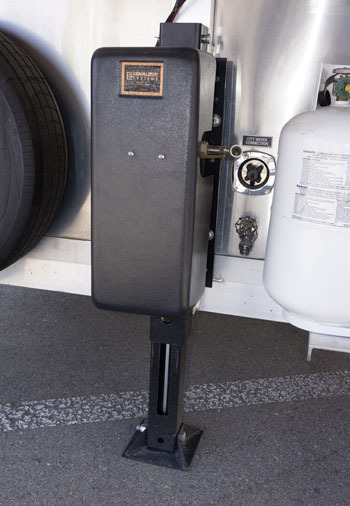 Saddlematic saddle rack is motorized to raise and lower your saddles to a comfortable chest high position, where you can easily handle bulky saddles. Let your youngster get their own saddle without being tackled by it. 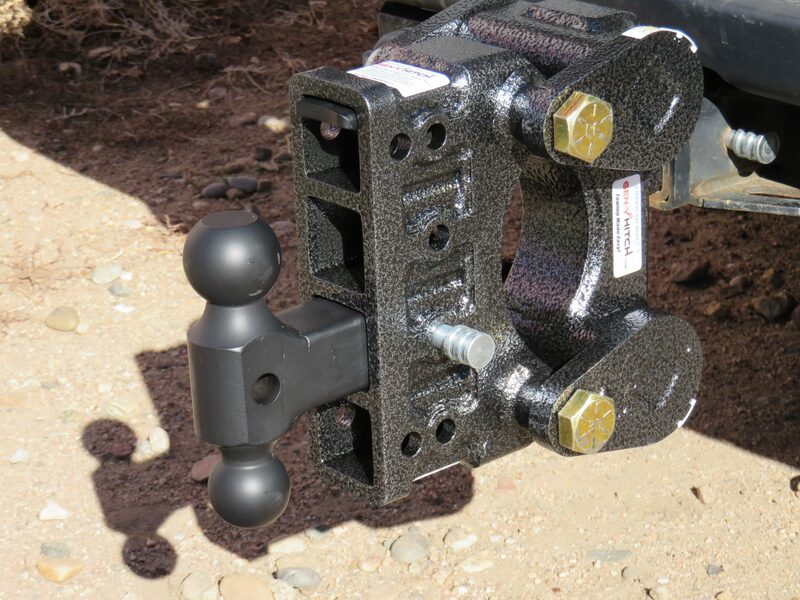 This horse trailer accessory will protect your saddles and your back. 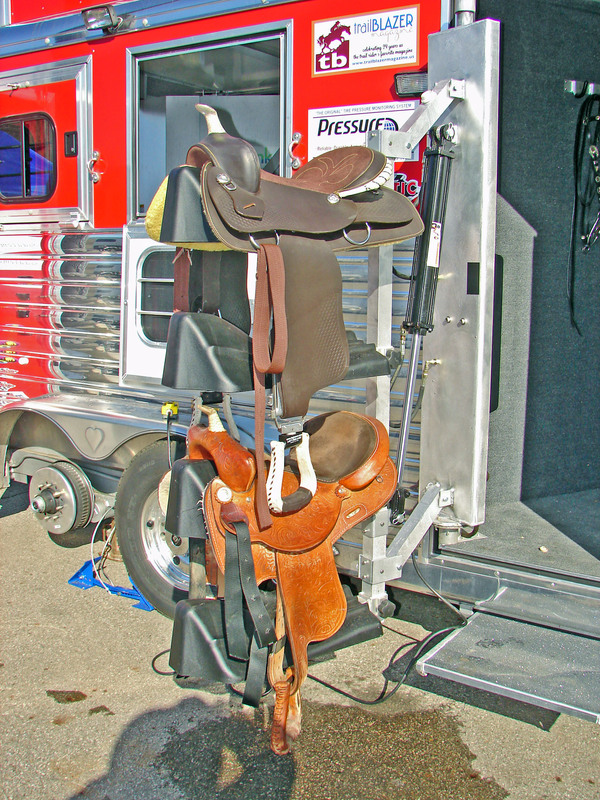 The swing out model locks into place inside and out.New Saddlematic saddle pads (left) are painted steel that grips. In some states with high humidity, a carpeted pad can mildew. 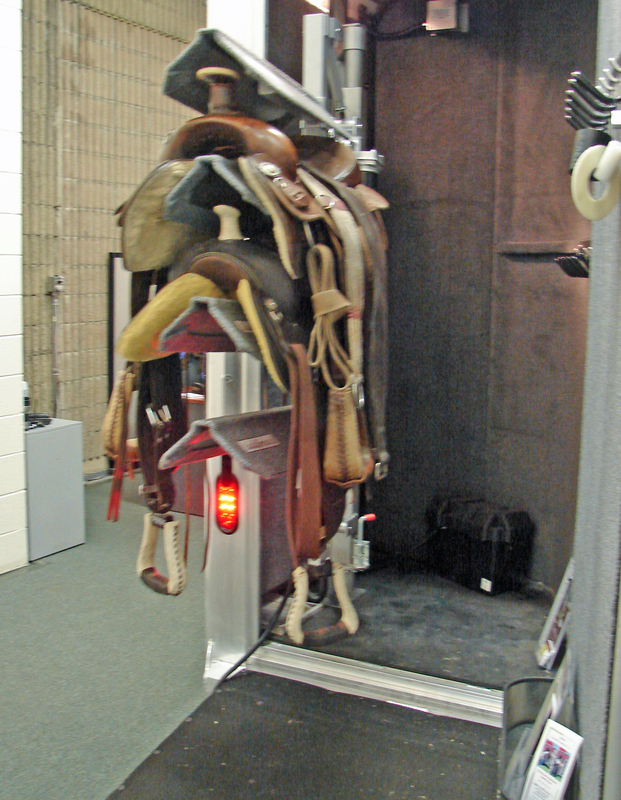 The rack is adjustable, holding up to 5 saddles. The model below is 5’2″, now saddles are easily within her reach. 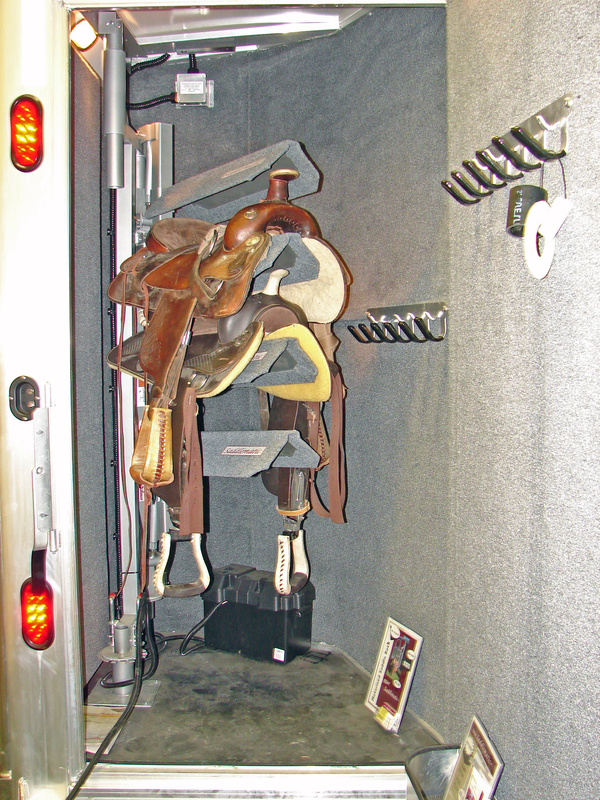 Watch the video, and see how easy loading and unloading your saddles can be. Don’t let your heavy saddles wear you out before the ride. Push the button, load them, fold them away and head for home with the swing out model. 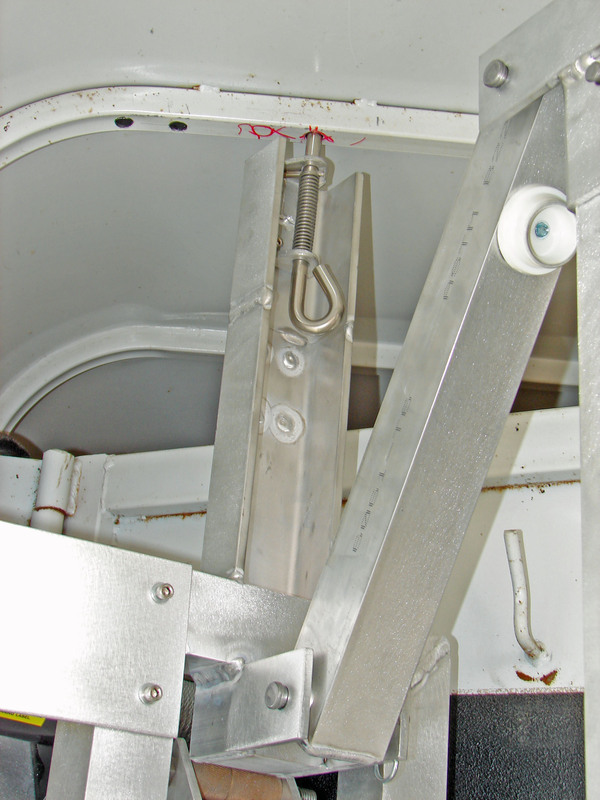 It swings outside of the tack door for easy access and locks into position. 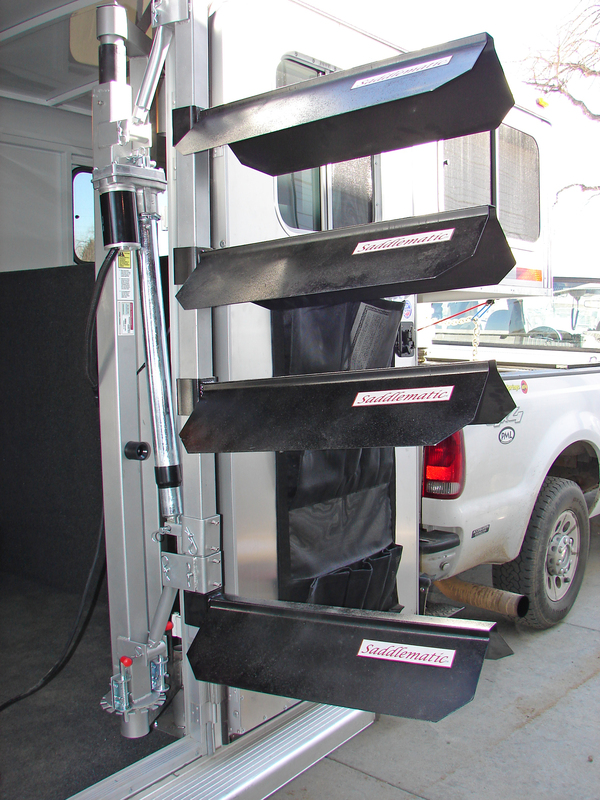 Think of Saddlematic as a tool for organizing your horse trailer. 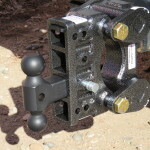 Rear swing out model can face in or out to keep your saddles secure. 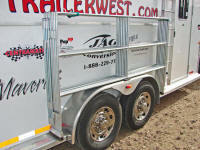 With the narrow doors on the rear of trailers, this model goes up and down but not out much. 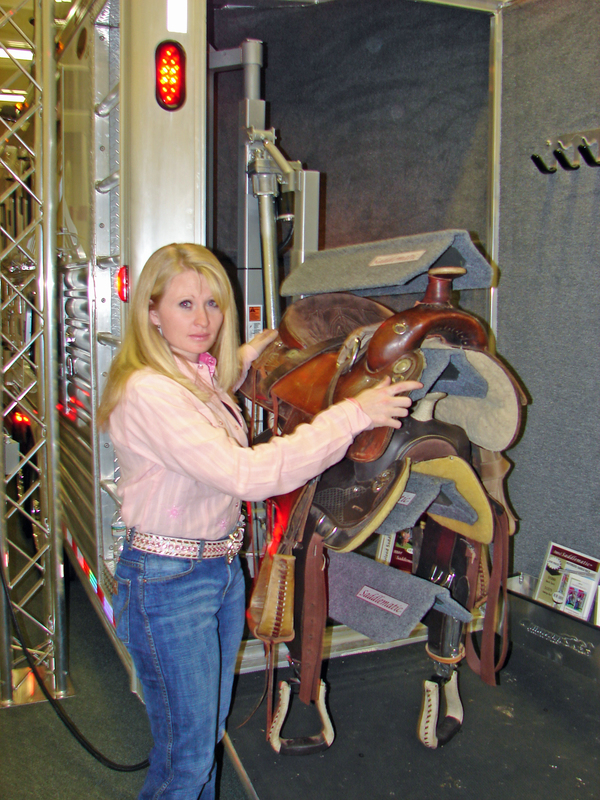 This way your saddles don’t get knocked off going out the door. 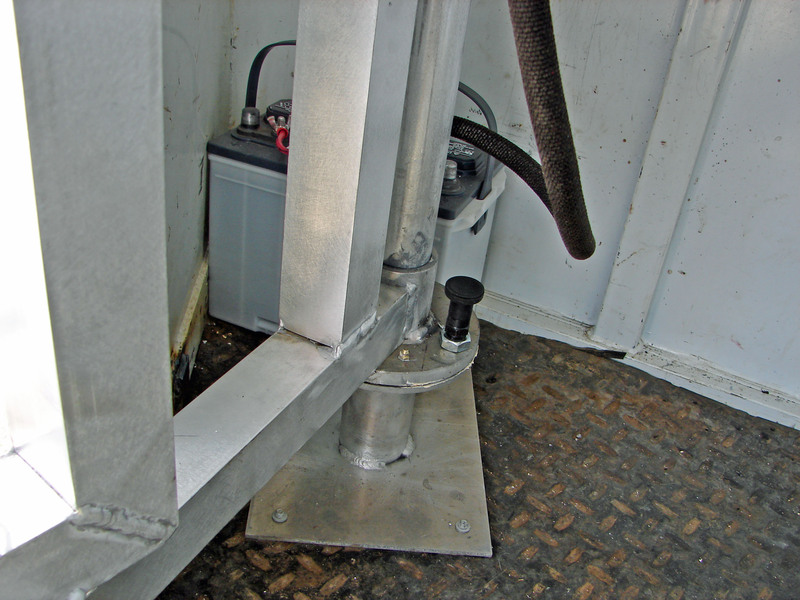 Saddlematic also can easily accommodate 4 rack models in a standard height trailer. 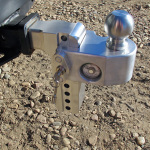 Saddlematic motorized saddle rack should be in your future! 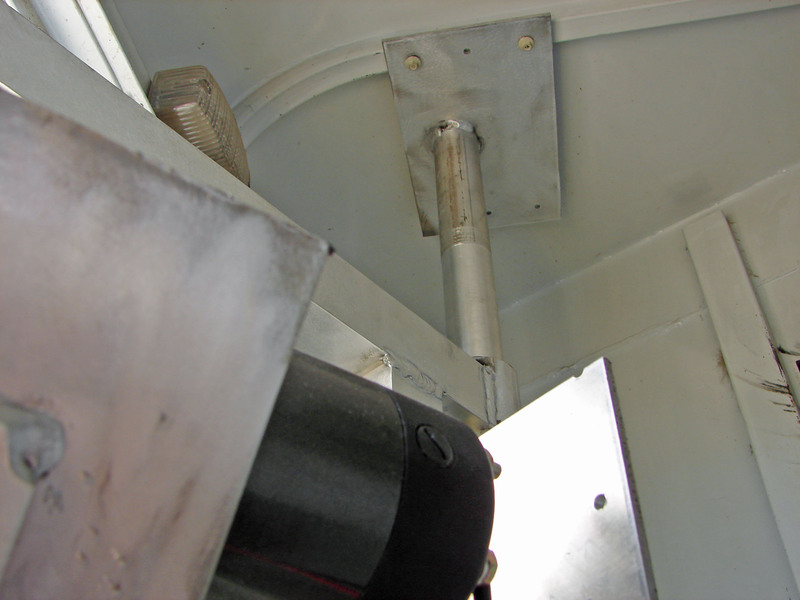 Simple sturdy all aluminum components. 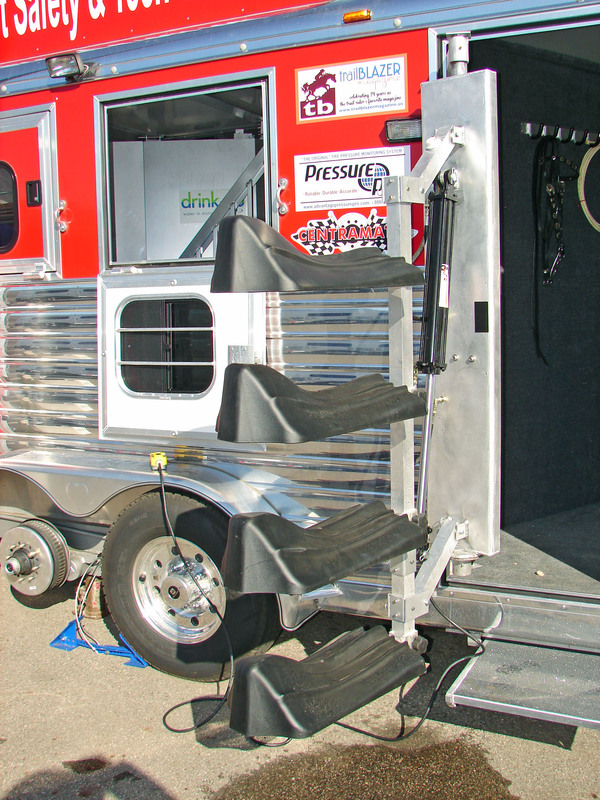 Stop tripping over, lifting and wrestling saddles in and out of your horse trailer. Takes less than 30 seconds to lower the saddles. 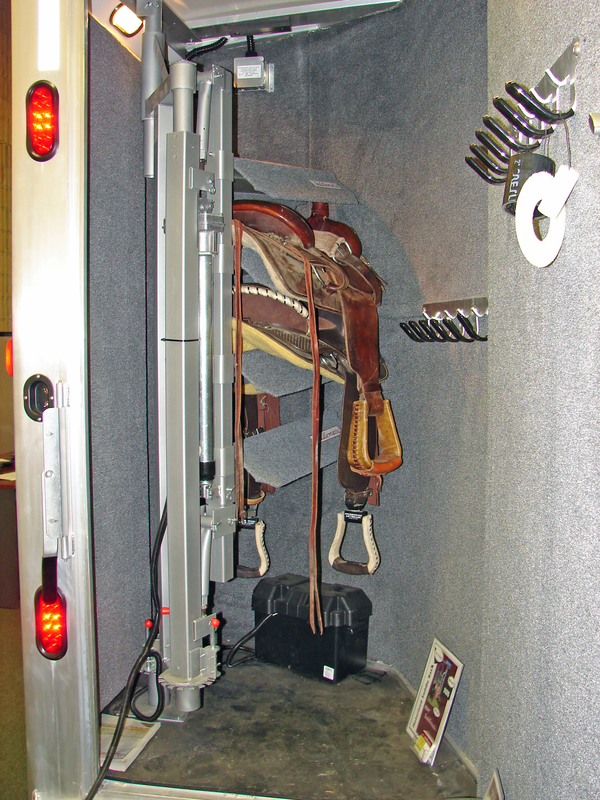 Saddlematic is a unique solution to let your saddle come to you. Protect your saddle and your back. 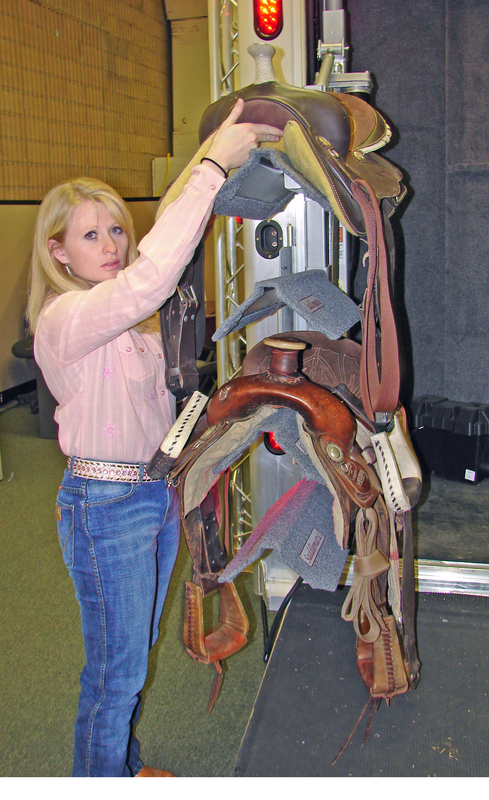 Stop lifting saddles over your head. Prevent injuries, protect that expensive saddle.